We offer quality Alternator Rotors that are available in different shapes and sizes as per the specifications detailed by our clients. These products are manufactured using optimum quality carbon, stainless steel and alloys to ensure productivity of the concerned process. Rotors in various sizes suitable for 35 Amp.s ~ 90 Amps. The rotors are of Squirrel Cage or Wound Rotor types. 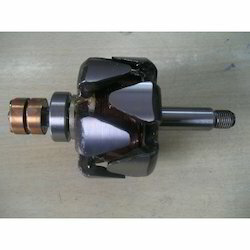 We are one of the most revered firms, offering an impeccable assortment of Alternator Rotor. We are highly acknowledged organization engaged in presenting remarkable range of Leyland Alternator Rotor. Offered Leyland Alternator Rotor is easy to install. 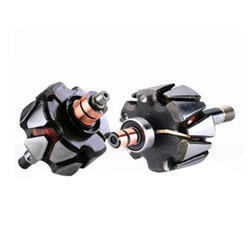 Being the foremost company, we are offering an exclusive array of2 Stroke Magnet Rotor. Our offered array is famous for its attractive functions. With our in-depth understanding of the Automobile Sector, we supply & trade sophisticated Rotor and Stator. It is engineered to provide current to the battery fixed in the engine thereby playing a critical role in smooth starting and functioning of the vehicle. Stators and Rotors are available for the entire range of alternators produced by Jumps. The Stator stacks are manufactured using virgin steel lamination. The Rotors are made using cold formed pole claws.